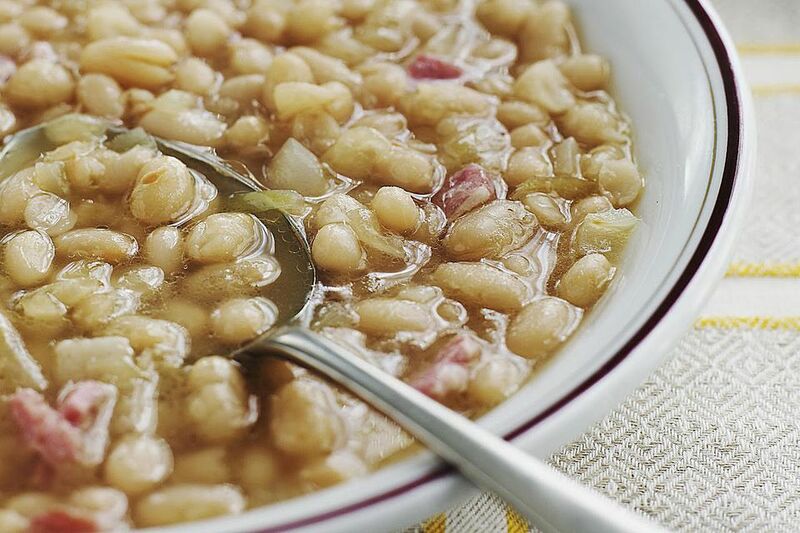 A version of this classic bean soup has been served in the U.S. Senate dining room for over 100 years. It can be made with Navy beans or Great Northern beans. The traditional recipe calls for a cup of mashed potatoes, but 2/3 cup of instant mashed potato flakes will do the job — and makes your job simpler. Braising the onion, celery, and garlic with a little wine develops more flavor than simply adding the chopped vegetables to the simmering soup. If you have leftover mashed potatoes, you can certainly use those instead. The addition of potatoes is attributed to a senator from Idaho. Potatoes and beans are seen together in soups from other regions, such as Galician bean soup (​caldo Gallego) from northwestern Spain, where cabbage or kale is also included. You can change this soup to your liking by adding other vegetables. Soak the beans in water overnight. Make sure the beans are covered with a couple of inches of water, as they can expand somewhat. In a heavy-bottomed soup pot, combine the vegetable stock, the drained beans, and the ham hock. Bring to a boil, then reduce heat to a simmer. Simmer, covered, for 2 hours, occasionally skimming off any scum that forms on the surface. In a separate saucepan, heat the butter over a low-to-medium heat. Add the onion, celery, and garlic to the butter and cook for 2 to 3 minutes or until the onion is slightly translucent, stirring more or less continuously. Add the onion mixture, parsley, and the potato flakes to the soup and simmer for another hour or until the beans are tender. Remove the ham hock, pull the meat off the bone, and chop it up. Return the chopped meat to the soup. If necessary, add more stock or water to the soup to adjust the thickness. Season to taste with kosher salt and white pepper and serve right away. If you don't want to soak the beans overnight, you can use a quick-soak method. Bring the beans to a boil in a large pot. Take them off the heat and let them stand for 1 hour. Then drain the beans and continue with the recipe. You can refrigerate leftover soup for up to five days and reheat it in the microwave. You can also make a large batch, portion it and freeze it. The soup will keep in the freezer for three months.